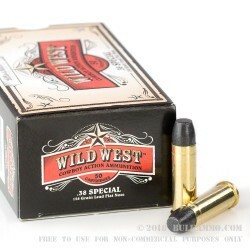 This 38 Special cartridge from Sellier & Bellot’s Wild West line of ammunition sports a 158 grain lead flat nose projectile. The bullet’s flat shape makes it ideal for target shooting, as the crips hole it will punch through a paper target is easily visible for instant feedback on your performance as well as scoring in competition. 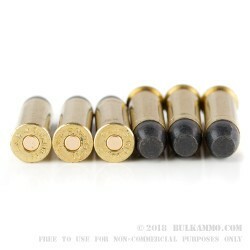 Its flat bullet also makes this round function exceptionally well in rifles with tubular magazines, such as the Henry Big Boy Carbine or Marlin M1894, as it is far less likely to cause a magazine detonation than a pointed tip bullet. This round has a 938 fps muzzle velocity, which is relatively slow but more than fast enough to compensate for its projectile’s somewhat less than aerodynamic profile. 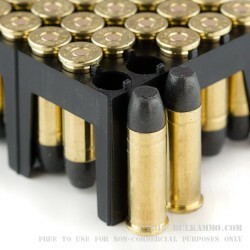 It further features a non-corrosive Boxer primed factory fresh brass casing, so you can keep this purchase alive for multiple trips to the range at your reloading bench. Sellier & Bellot is one of the oldest companies on earth, and as such they’ve had ample time to perfect their manufacturing processes. 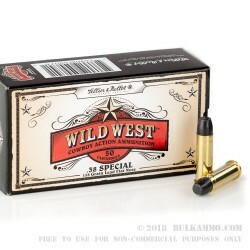 Whether you’re into cowboy action shooting or just good old-fashioned backyard plinking, you’ll find a lot to value in this hard-working cartridge.